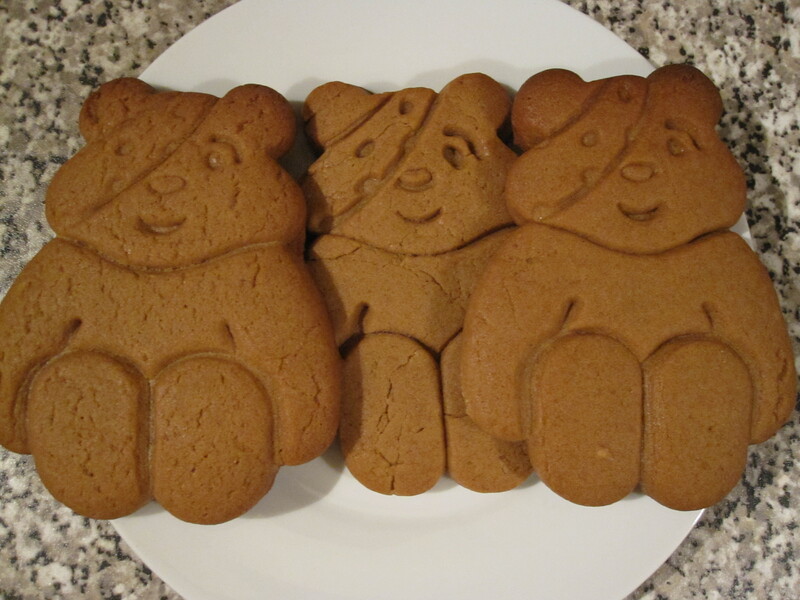 For Children In Need this year I will be doing my bit by baking for the office. I have a battle plan for this week to make sure I’ll have lots of treats, and lots of donations! These are made from the same gingerbread recipe I used for gingerbread cottages last year but made in lovely thick, ginger biscuits. I tried the recipe that came on the back of the Pudsey cookie cutter but the biscuits spread far too much so I won’t be selling those, no one wants deformed bear biscuits! – Heat the oven to gas mark 6 and prepare two baking trays… or more if you can do more than two trays at a time! – Roll out the dough to the thickness of your Pudsey cookie cutter. Do this by placing the cutter on the worksurface next to the dough and rolling over that too so you don’t go too far. – Bake for ~10 minutes watching carefully because it is very easy to burn these. – Once out of the oven allow the biscuits to cool on the trays for 5-10 minutes until hard then cool completely on a wire rack. – Repeat for the rest of the dough.